It was as if the handsome frigate knew that she and her two-hundred-odd company were going home. After leaving the Caribbean she had quickly picked up a reliable westerly and now hitched up her skirt and flew, overtaking the broad Atlantic waves one by one in an eager swooping that had even old hands moving cautiously about the deck. Channel fever was aboard and it gripped every soul. Soon after the chaos and drama of Trafalgar, HMS L’Aurore had been sent to join an expedition to wrest Cape Town from the Dutch. Success there had not been matched by the following ill-starred attempt at the South American colonies of Spain, and after capturing the capital, Buenos Aires, they had been forced to an ignominious surrender. Their later few months of service in the Caribbean had been abruptly terminated in an Admiralty summons to return to England. No doubt her captain was wanted at the vengeful court-martial to follow. But at last the handsome frigate and her crew were homeward bound. Standing braced on the quarterdeck, Captain Thomas Kydd tried to take pleasure in the seething onrush of his fine command but he couldn’t shake a feeling of foreboding. His old friend and confidential secretary, Nicholas Renzi, had come on deck to join him. They’d shared countless adventures since they’d met as common seamen so long ago and had no secrets between them. ‘It’s been over a year and I’ve heard not a thing.’ Renzi’s head dropped. It was no use pining, though: he had to accept he was clearly not destined to be a novelist. Nothing would please Kydd more than to see the long attachment between his sister and his particular friend brought to a satisfactory conclusion. ‘Yes?’ Kydd said, his voice rising. It was the age-old excitement of landfall. A screamed hail from the volunteer masthead lookout, whose height-of-eye was more than that of the legitimate watch-keeper in the fore-top, sent pulses racing. The man would later claim his reward from the tots of his shipmates. The pace of their homecoming quickened: now England would be in sight constantly, the well-known seamarks passing in succession until they reached the great anchorage at Portsmouth – Spithead. The Needles, white and stark against the winter grey, were Kydd’s reminder that within hours all would be made clear. The order that had reached out to him in the Caribbean would have been followed by another, now waiting in the port admiral’s office. Relieved of his command pending court-martial? Open arrest? Gulping, he realised that these last few sea-miles might very well be the last he would make under the ensign he had served since his youth. Rounding Bembridge Point would bring Spithead into view and, if the fleet was in, he must make his report to the admiral afloat. If they were at sea, it would be to the port admiral in the dockyard. Gun salutes, of course, would be needed in either case. The deck was crowded with men gazing at the passing shoreline, some thoughtful and silent, others babbling excitedly and laughing. It seemed the entire crew was on deck. L’Aurore had long since been willingly prettified to satisfaction but she was a king’s ship and had her standards. And he knew the real reason for his outburst and was sorry for it. Would the crew remember him fondly or . . .? The point soon yielded its view of the fleet anchorage – but four ships only and bare of any admiral’s flag. Thus it would be the port admiral to whom he would make his number. Her distinguishing pennants snapping at the mizzen halyards in an impeccable show, L’Aurore rounded to and her anchor plunged into the grey-green water. With a tight stomach he boarded his barge, taking his place in the sternsheets and determined not to show any hint of anxiety. ‘Bear off,’ he growled at his coxswain, Poulden. The boat’s crew seemed to sense the tension and concentrated on their strokes even as they passed close by the raucous jollity of Portsmouth Point. Reaching the familiar jetty oars were tossed in a faultless display and the boat glided in. 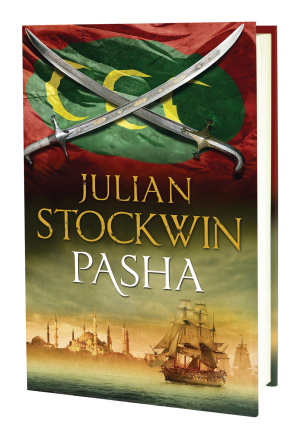 ‘Lay off, Poulden,’ Kydd ordered, and stepped on to English soil for the first time in what had seemed so long. It had been nearly two years. There was no point in delaying: he turned and strode briskly up the stone steps. At the top, unease gripped him as he saw a line of armed marines ahead. Orders screamed out, muskets clashed, and an officer began marching smartly across. The flag-lieutenant stood to one side in open admiration. There was nothing for it, and with a senior admiral at his side, Kydd did the honours, pacing down the line of marines wearing an expression of being suitably impressed, stopping with a word to one or two. At the end there was a flourish of swords and the party was released to go to the admiral’s reception room. ‘Nonsense! A smart action – and deserving of your prize-money,’ he added, with a touch of envy. The port admiral turned to his flag-lieutenant. He was back but not with a pack of detailed orders, just one, folded and sealed with the Admiralty cipher. Kydd signed for it, with only the slightest tremor to his hand. ‘Do excuse me, sir,’ he said, as he stepped aside to read. It was short, almost to the point of rudeness. He was to place his ship under the temporary command of the port admiral forthwith pending refit while he should lose no time in presenting himself in person to the first lord of the Admiralty. His heart bumped. There was a world of difference between a public hero and a naval delinquent and, without doubt, this was going to be the true reckoning. The wait is almost unbearable. When can I download to my iPad? Best best. News I have had all day!! Cannot wait I will practically breaing down the door of the bookshop to purchase my copy. I will read it in a sitting and re read again. Sadly my late father is not arround to read it. He was a real hero of the arctic convoys! My appetite is drooling, bring it on. I have just started Caribee, that will hold me for now. I am a Stockwin fan. Enough to whet an already keen appetite. The sooner, the better!!! When will it be posted out. Itching to read it now. Hopefully the Collectors Sets will go off a couple of days before official publication. Wow, this books looks promising from the very beginning! I can’t wait to borrow this book from the library when it comes out! It would seem that Julian gets better with every episode. Roll on publication!!! Can’t wait for the book to arrive!! It looks like it’s going to be a really good read.